During menopause, the level of oestrogen falls which is manifested through a number of unpleasant ailments. The most frequent of them are: hot flushes, instable mood, constant irritation and constant drowsiness. To increase mental and physical comfort in this period, providing the body with substances similar to oestrogen derived from plants, i.e. phytoestrogens is recommended. Red clover which is also an ingredient of VITAMINS FOR HER 50+ is an indispensable female ally during this time. This unique plant is a rich source of isoflavones, easily absorbed by the body, which offer the desired relief during the menopause. Red clover does not need to have four leaves to bring you good luck. During menopause, the female body is extremely susceptible to diseases, especially ones related to the circulatory and skeletal system. In addition to phytoestrogen supplementation, making sure that the body is provided with an adequate number of nutritive elements is also recommended. 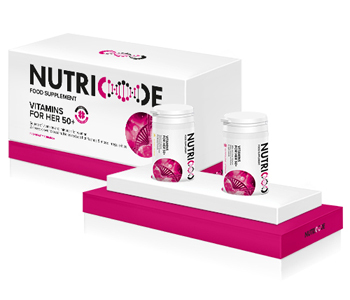 Therefore, VITAMINS FOR HER 50+ is a carefully selected composition of vitamins and minerals created to cater for the needs of mature women. This product is intended to offer vitality and allow women to enjoy their perfect condition. Daily chores will no longer be so cumbersome. A carefully selected set of vitamins and minerals which is an excellent promoter of health of women aged 50+ additionally alleviating menopausal symptoms.